This thread it meant to gather ideas to enhance backer participation for community events like the play-test-weekends. One mayor concern that was raised on the community discord, were the seemingly unspectacular email notifications that were send beforehand. 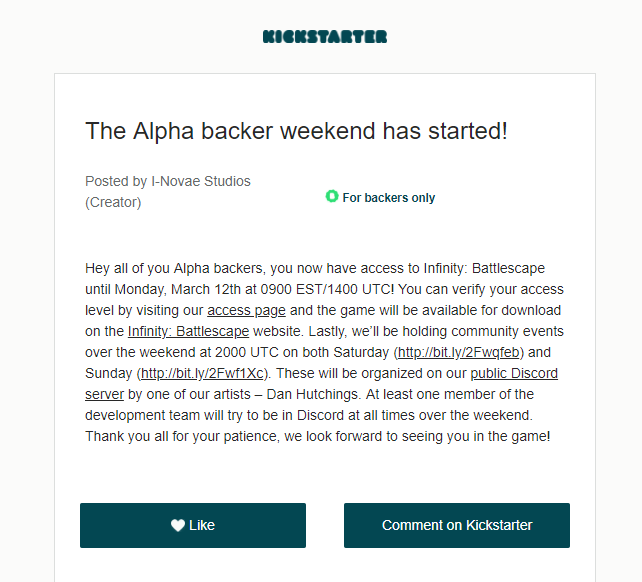 Dear [Backer name], your Infinity: Battlescape download is ready! My suggestion is using something like https://sendgrid.com/pricing/ that offers you some protection, integration and allows fully custom emails and contact handling to boot. I suspect they already have a decent solution, the original kickstarter alert emails were send from contact@inovaestudios.com with a custom designed email. I think they used https://mailchimp.com back then. The links at the bottom of theirs mail pointed to configuration sites from mailchimp. The links to edit mail list preferences are dead so they probably terminated whatever account they had there. I completely agree the messaging was terrible. Better than last time, but still awful. I assume you mean Thursday the previous week? I think 2 weeks notice, then 1 week, then 2 days, then a final email on the day. I think that wording needs a re-think. Their reward is the Alpha which is not released yet. 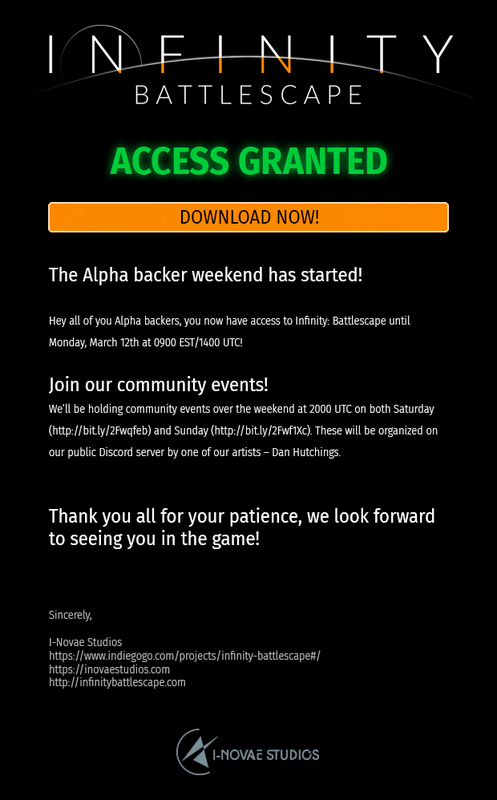 These pre-alpha weekends are not the reward they selected, they’re just a preview. I thought about that. I wouldn’t oversaturate backers with these kinds of emails, it gets old quick. People that are interested enough to care about this event happening a week or two in the future probably read the usual dev updates anyway (were the events are announced). On the other hand, people that are not as involved are those who we want to adress with this email. Telling them about something so far off in the future might just make them lose interest in the long term, I don’t think this audience will remember this announcement even two days after reading the email, so there is no point in even doing it and risking beeing perceived as spam email. I guess it really is misleading . The other with the download is better, but not ideal either. I think you’ve made some pretty wild assumptions there. We’re talking about people who have already expressed an interest in playing the game by backing it with their money. Reading weekly development updates is entirely different from finally getting their hands on the game. I don’t understand your logic that a) if you’re not interested in weekly updates then you won’t be interested in playing, and b) interest in playing will change dramatically depending on whether you can play in 2 weeks or 2 days. I hardly think 2 weeks counts as “so far off in the future”! I would agree that people would have little interest if they were told they’d be able to play for a weekend in 6 months time, but for many people 2 weeks may be the minimum notice they need in order to keep their weekend free of other engagements. Regarding spamming people, again, these are people who have indicated their interest by parting with their hard earned money. Any email regarding getting their hands on the thing they ‘paid’ for can not be considered unsolicited. If they are no longer interested they can unsubscribe. My assumption is that most backers who don’t read the weekly updates probably won’t remember or care about an email that was send two weeks ago nevermind actively reserve a weekend just to play a game that they showed medium to little interest in. People spend money and lose interest all the time, especially if we are talking about years and not weeks or months. Maybe my thought was worded wrong. What I wanted to say is that in order for this email to make the biggest impact, its effect maybe shouldn’t be weakend by an email that was send two or one week before that made the reader only wait and not take action. Maybe more emails might be the safer bet though. My feeling is if the recipient doesn’t care, no harm done. If they won’t remember, no harm done and they’ll get reminded again closer to the time. On the other hand, if they do care and will reserve the weekend then yay, +1 to the player count. Regarding the ‘impact’ of the email being weakened, ie the recipient’s interest peaking too soon and trailing off to the point where they are no longer interested when the weekend arrives, I can understand that concern. But if they’re that uninterested then I don’t think I can get too worried about their engagement. I think one week in advance is a good compromise. Concerning guesstimating peoples behavior: I don’t think someone will make time in such a drastic way that they need to be informed two weeks in advanced if they are not already quite the fans. True there are quite a few passionate fans that do hibernate but I don’t think they are the majority of the alpha backers. I think the email mockup from the op is quite spot on. Nothing to change there really. The subject field is tricky though. The proposed subject lines are quite misleading. Alpha Weekend isn’t descriptive enough. It does imply that Alpha started but it does not state it. “Claim your Kickstarter reward!” is more in the grey zone in my opinion. Technically it’s part of the reward but practically what this reward means has changed due to the delays. We had quite some people ask about the state of the Alpha during the last couple of months. An idea would be to ask them if they knew about the events, participated and if not, why. I think most of them did not read the weekly updates. I also promoted the weekend across numerous websites, in a couple of posts and then the live stream videos posted here and images etc on (ED, SC, Linus Tech tips, Descent underground forums). Plus kept Bluedrake, Scott Manley, Angry Joe and David Haddock (Star Citizen lead writer, and his team who also like I:B) updated in the 7 days leading up to the weekend. * Dave Haddock replied that they read all the update news letters each week I post on the SC forums, and links thru to here. The mock up email from the top of the thread looked really good to me, just like ED/Frontier would do and it works for them. As long as there is a non-html aspect to the email for those that still strip out html and just prefer plain text. Also, not that I check, but was ther also a ‘countdown’ type of posting used on Twitter and facebook, Instagram, Vine, etc and other current social media (what ever that may be these days). Maybe a count down ticker and one or two pre-teaser ‘new features’ images posted per 24 hour cycle leading up to the weekend. Mess around a bit with Instagram filter etc, of dev team, and bobble heads. Maybe also a competition for some fancy custom paint job skins, or something like if the user spends more than 3 hours ingame. Something like that. What do ED and SC do with free skins, how do users get them? What triggers it. One new free skin for the basic main ship (and or Bomber) per alpha/beta weekend etc. Nothing over the top, but within the games universe. Jet black, jet matte black, rust heap! etc.